Abstract: Nanotechnology has considerably accelerated the growth of regenerative medicine in recent years. Application of nanotechnology in regenerative medicine has revolutionized the designing of grafts and scaffolds which has resulted in new grafts/scaffold systems having significantly enhanced cellular and tissue regenerative properties. Since the cell–cell and cell-matrix interaction in biological systems takes place at the nanoscale level, the application of nanotechnology gives an edge in modifying the cellular function and/or matrix function in a more desired way to mimic the native tissue/organ. In this review, we focus on the nanotechnology-based recent advances and trends in regenerative medicine and discussed under individual organ systems including bone, cartilage, nerve, skin, teeth, myocardium, liver and eye. Recent studies that are related to the design of various types of nanostructured scaffolds and incorporation of nanomaterials into the matrices are reported. We have also documented reports where these materials and matrices have been compared for their better biocompatibility and efficacy in supporting the damaged tissue. In addition to the recent developments, future directions and possible challenges in translating the findings from bench to bedside are outlined. With the advent of nanotechnology, regenerative medicine has evolved tremendously in recent years and appears to be a promising approach in restoring function and regeneration of diseased tissues and organs. Since cell function occurs at the nanometer scale, nanotechnology can influence and even alter cellular behavior, which ultimately enhances the functioning of tissue or organ. The traditional approaches of nanotechnology in regenerative medicine can be related to: 1) nanoparticles; 2) scaffolds with nanofibers; 3) scaffolds with nanotopographic modifications; 4) drug/gene delivery; and 5) extracellular matrix (ECM) patterning. The newer and rational approaches include a combination of these traditional methods. The purview of this article is to cover recent advances in nanotechnology for regenerative medicine. Only those organ systems have been considered where considerable research is ongoing. The information provided herein is mainly taken from the PubMed articles published over the last 6 years (2009–2014). The keywords specifically used to generate the literature search for this review paper were: “bone;” “cartilage;” “nerve;” “myocardium;” “skin;” “eye;” “teeth;” “liver;” “regenerative medicine;” and “nanotechnology.” Most of the references in this review paper are the original research articles; a few refer to recent reviews on the topic. This review article discusses various advances in nanotechnology-based regenerative medicine for the repair or enhancement of damaged tissues function in various organ systems. 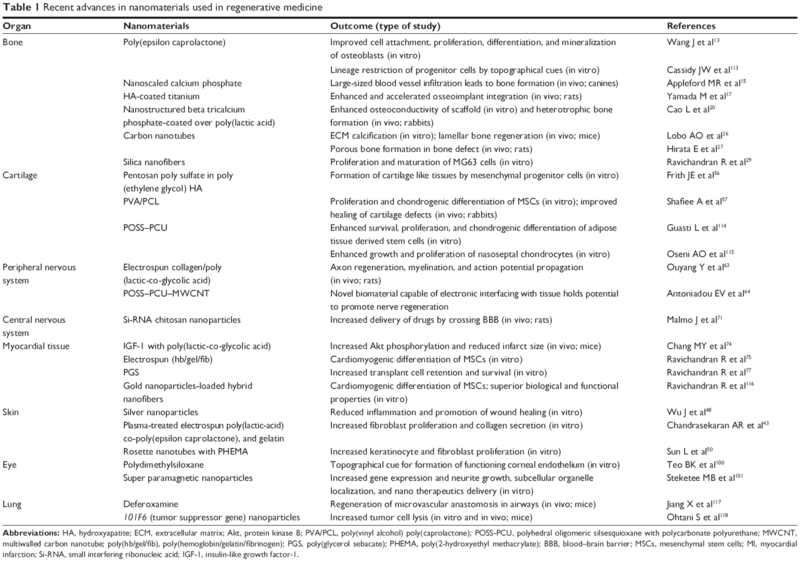 Table 1 summarizes the different nanomaterials recently used for tissue/organ regeneration with the references. Figures representing the nanotechnology-based approaches for regeneration of bone (Figure 1) and skin (Figure 2) are included. Abbreviations: HA, hydroxyapatite; ECM, extracellular matrix; Akt, protein kinase B; PVA/PCL, poly(vinyl alcohol) poly(caprolactone); POSS-PCU, polyhedral oligomeric silsesquioxane with polycarbonate polyurethane; MWCNT, multiwalled carbon nanotube; poly(hb/gel/fib), poly(hemoglobin/gelatin/fibrinogen); PGS, poly(glycerol sebacate); PHEMA, poly(2-hydroxyethyl methacrylate); BBB, blood–brain barrier; MSCs, mesenchymal stem cells; MI, myocardial infarction; Si-RNA, small interfering ribonucleic acid; IGF-1, insulin-like growth factor-1. 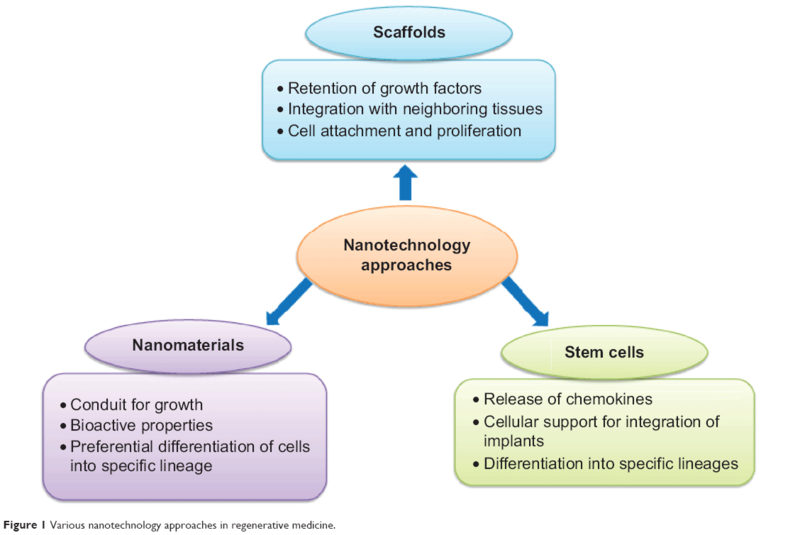 Figure 1 Various nanotechnology approaches in regenerative medicine. Figure 2 Schematic representation of bone regeneration using nanotechnology. 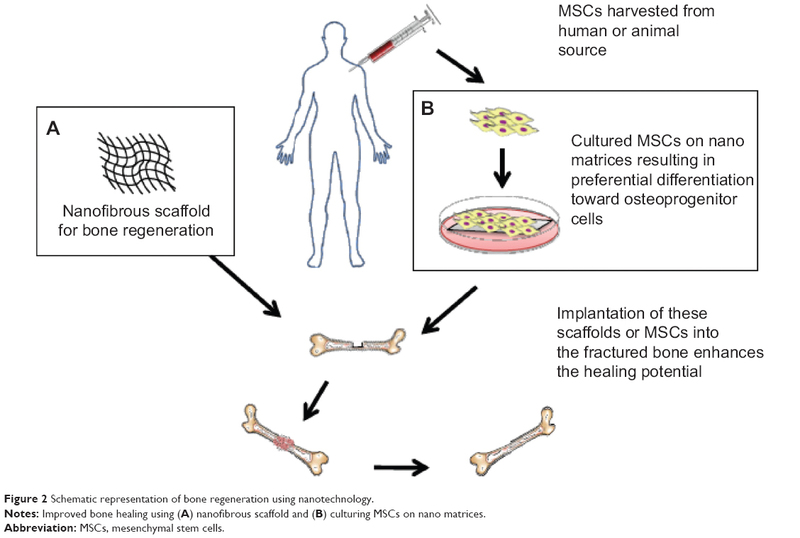 Notes: Improved bone healing using (A) nanofibrous scaffold and (B) culturing MSCs on nano matrices. Abbreviation: MSCs, mesenchymal stem cells. Bone tissue may be considered as a nanocomposite consisting mostly of collagen and hydroxyapatite (HA) containing calcium phosphate. Embedded in this matrix are osteocytes, osteoblasts, osteoclasts, and other smaller bone-related proteins. Bone tissue loss may occur due to trauma, organic bone diseases, infectious diseases, and surgeries; reconstruction of the functional bone remains a major challenge for the orthopedic surgeons. The skin is the largest organ in the body that provides mechanical support to inner organs, regulates body temperature, and plays a critical role in the synthesis of vitamin D. It is more prone to mechanical injuries and infection because it is the outermost covering of the body. Presently, no bioengineered skin models exist that can completely mimic the anatomical, physiological, and biological characteristics of normal, healthy skin.40,41 It is important to mention that wound healing using nanotechnology remains a major area of research interest worldwide and an exhaustive report on this topic is beyond the scope of this review. Nevertheless, the research efforts concerned with skin regeneration are briefly outlined in the following sub-sections: (i) nanostructured scaffolds (ii) nanoparticles as delivery systems (iii) hydrogels and (iv) stem cells for skin regeneration. A schematic representation of skin regeneration by nanotechnological approaches is shown in Figure 3. 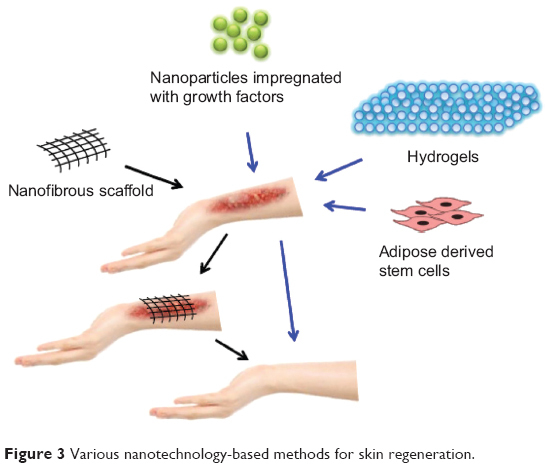 Figure 3 Various nanotechnology-based methods for skin regeneration. Cartilage, composed mostly of type II collagen, is the nonmineral component of the skeletal system and provides frictionless joint mobility. The natural healing mechanism of cartilage injury is limited, due to its avascularity and absence of stem cells. Recent nanotechnology advances have the potential to be translated into the clinical applications by increasing the healing ability of the cartilage significantly. The distinctive regeneration characteristics between the CNS and peripheral nervous system (PNS) limit the application of nanobiotechnology in the CNS regeneration as compared to the PNS. This is due to the active role of the myelin sheath and the Schwann cells in PNS regeneration, in contrast to the limited success of oligodendrocytes remyelinating the nerve cells in the CNS. The human tooth consists of two major parts, the visible crown and the root; the root is usually not visible and is anchored within the bone. Enamel, dentin, pulp, and cementum are the four different tissues present within each tooth. Dentin, which makes up the majority of the inner surface of the tooth, mainly contains collagen I fibrils. Diseases affecting the teeth are increasingly encountered nowadays, mainly due to changes in food habits and an increase in the longevity of humans, making them edentulous. Carious infections of the teeth tend to decrease the degree of calcification that adversely affects the strength of the teeth.78 The potential application of nanotechnology in dentistry is the development of the long-lasting biocompatible dental implants with improved osseointegration and mechanical properties.79 These surface-modified implants have the potential of effectively replacing, both structurally and functionally, the worn-out tooth and are being increasingly recognized as the most promising option for dental regeneration. 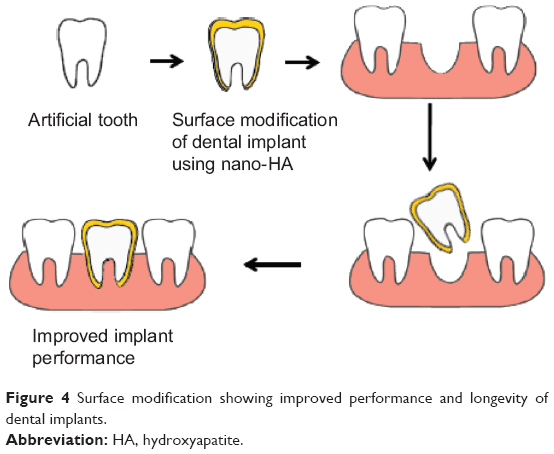 A schematic diagram showing surface modification of dental implants for improved implant performance is depicted in Figure 4. Figure 4 Surface modification showing improved performance and longevity of dental implants. Nanoparticles are being increasingly used in drug delivery systems, commercial food products, clothing, and cosmetics. Martirosyan and Schneider have reviewed the consumer safety of nanoparticles used by the general public.112 Owing to limited knowledge and restricted studies on the harmful effects of these nanoparticles, exposure risks to patients, health care personnel, research scientists, and the general public remain a matter of concern. More rigorous and controlled studies are necessary to confirm the safety of nanoparticles. The need to apply nanotechnology in regenerative medicine is being increasingly recognized. Incorporation of nanotechnology allows better control over physical and biological properties of a biomaterial than conventional technologies. One of the major applications in this field is the use of nanostructures having native tissue mimicking ability, which has resulted in the development of long-lasting and better-performing scaffolds. Extensive research is being conducted on the use of scaffolds seeded with stem cells to generate bone and cartilage. However, the success of this technique is limited by the availability of stem cells and their efficiency in regeneration. The enhancement of axonal growth using nanofiber conduits for the treatment of neuronal injuries is also being explored. Efforts are presently directed toward the development of nanofibers, which help provide properties similar to those of natural cardiac tissue. The clinical use of growth factors in wound healing has generated considerable research interest in recent years. Biodegradable scaffolds integrated with multiple growth factors appear to be the most promising therapeutic option for skin tissue regeneration. There is limited work on the application of regenerative nanomedicine in ophthalmology. Nevertheless, efforts are on to explore nano-ophthalmology with an ultimate aim to maintain and restore vision. Nanotechnology applications to regenerative medicine have all the potential to revolutionize tissue regeneration and repair. However, the development of ideal nanomaterials capable of sending signals to the diseased or damaged cells and tissues to trigger the regeneration process still remains a challenge. It is also difficult to engineer ECM proteins that can function exactly like the native tissue ECM protein in the internal milieu. The careful and radical selection of the new polymer matrix/nanomaterial combination is essential in making scaffolds with superior biomimicking ability, whose chemical composition and structure can be well-optimized. Improvement in already existing scaffolds is necessary to overcome the associated limitations. The safety of human health in terms of the use of nanomaterials in regenerative medicine is a matter of considerable concern, because this field is still in its nascent stage. Prior to human applications, studies on the toxic effect of these nanomaterials should be carried out in great detail. Finally, to understand the underlying mechanisms of cell-biomaterial interactions at the nanoscale level, and to be able to translate the findings from bench to bedside, close collaboration between the scientists and clinicians is of utmost importance. The authors report no conflict of interest in this work. Medical Research Council Centre for Regenerative Medicine. [homepage on the Internet]. What is regenerative medicine? Edinburgh, Scotland: The University of Edinburgh; 2012. Available at: http://www.crm.ed.ac.uk/about/what-regenerative-medicine. Accessed November 29, 2013. Chiapasco M, Giammattei M, Carmagnola D, Autelitano L, Rabbiosi D, Dellavia C. [Iliac crest fresh-frozen allografts and autografts in maxillary and mandibular reconstruction: a histologic and histomorphometric evaluation.] Minerva Stomatol. 2013;62(1–2):3–16. Italian [with English abstract]. DePalma AF, Rothman RH, Lewinnek GE, Canale ST. Anterior interbody fusion for severe cervical disc degeneration. Surg Gynecol Obstet. 1972;134(5):755–758. Navarro M, Michiardi A, Castaño O, Planell JA. Biomaterials in orthopaedics. J R Soc Interface. 2008;5(27):1137–1158. Giannoudis PV, Dinopoulos H, Tsiridis E. Bone substitutes: an update. Injury. 2005;36 Suppl 3:S20–S27. Lee JH, Nam H, Ryu HS, Seo JH, Chang BS, Lee CK. Bioactive ceramic coating of cancellous screws improves the osseointegration in the cancellous bone. J Orthop Sci. 2011;16(3):291–297. Zhang L, Webster TJ. Nanotechnology and nanomaterials: promises for improved tissue regeneration. Nano Today. 2009;4(1):66–80. Holmes B, Castro NJ, Li J, Keidar M, Zhang LG. Enhanced human bone marrow mesenchymal stem cell functions in novel 3D cartilage scaffolds with hydrogen treated multi-walled carbon nanotubes. Nanotechnology. 2013;24(36):365102. Peng H, Yin Z, Liu H, et al. Electrospun biomimetic scaffold of hydroxyapatite/chitosan supports enhanced osteogenic differentiation of mMSCs. Nanotechnology. 2012;23(48):485102. Yao C, Slamovich EB, Webster TJ. Enhanced osteoblast functions on anodized titanium with nanotube-like structures. J Biomed Mater Res A. 2008;85(1):157–166. Wang M, Castro NJ, Li J, Keidar M, Zhang LG. Greater osteoblast and mesenchymal stem cell adhesion and proliferation on titanium with hydrothermally treated nanocrystalline hydroxyapatite/magnetically treated carbon nanotubes. J Nanosci Nanotechnol. 2012;12(10):7692–7702. Jang JH, Castano O, Kim HW. Electrospun materials as potential platforms for bone tissue engineering. Adv Drug Deliv Rev. 2009;61(12): 1065–1083. Wang J, Valmikinathan CM, Liu W, Laurencin CT, Yu X. Spiral-structured, nanofibrous, 3D scaffolds for bone tissue engineering. J Biomed Mater Res A. 2010;93(2):753–762. Alves Cardoso D, Jansen JA, Leeuwenburgh SC. Synthesis and application of nanostructured calcium phosphate ceramics for bone regeneration. J Biomed Mater Res B Appl Biomater. 2012;100(8):2316–2326. Appleford MR, Oh S, Oh N, Ong JL. In vivo study on hydroxyapatite scaffolds with trabecular architecture for bone repair. J Biomed Mater Res A. 2009;89(4):1019–1027. Raimondo T, Puckett S, Webster TJ. Greater osteoblast and endothelial cell adhesion on nanostructured polyethylene and titanium. Int J Nanomedicine. 2010;5:647–652. Yamada M, Ueno T, Tsukimura N, et al. Bone integration capability of nanopolymorphic crystalline hydroxyapatite coated on titanium implants. Int J Nanomedicine. 2012;7:859–873. Wennerberg A, Jimbo R, Allard S, Skarnemark G, Andersson M. In vivo stability of hydroxyapatite nanoparticles coated on titanium implant surfaces. Int J Oral Maxillofac Implants. 2011;26(6):1161–1166. Tripathi A, Saravanan S, Pattnaik S, Moorthi A, Partridge NC, Selvamurugan N. Bio-composite scaffolds containing chitosan/nano-hydroxyapatite/nano-copper-zinc for bone tissue engineering. Int J Biol Macromol. 2012;50(1):294–299. Cao L, Duan PG, Wang HR, et al. Degradation and osteogenic potential of a novel poly(lactic acid)/nano-sized β-tricalcium phosphate scaffold. Int J Nanomedicine. 2012;7:5881–5888. Azami M, Tavakol S, Samadikuchaksaraei A, et al. A Porous Hydroxyapatite/Gelatin Nanocomposite Scaffold for Bone Tissue Repair: In Vitro and In Vivo Evaluation. J Biomater Sci Polym Ed. 2012;23(18):2353–2368. Tavakol S, Azami M, Khoshzaban A, et al. Effect of laminated hydroxyapatite/gelatin nanocomposite scaffold structure on osteogenesis using unrestricted somatic stem cells in rat. Cell Biol Int. 2013;37(11): 1181–1189. Uskoković V, Hoover C, Vukomanović M, Uskoković DP, Desai TA. Osteogenic and antimicrobial nanoparticulate calcium phosphate and poly-(D,L-lactide-co-glycolide) powders for the treatment of osteomyelitis. Mater Sci Eng C Mater Biol Appl. 2013;33(6):3362–3373. Gruskin E, Doll BA, Futrell FW, Schmitz JP, Hollinger JO. Demineralized bone matrix in bone repair: history and use. Adv Drug Deliv Rev. 2012;64(12):1063–1077. Tavakol S, Khoshzaban A, Azami M, et al. The effect of carrier type on bone regeneration of demineralized bone matrix in vivo. J Craniofac Surg. 2013;24(6):2135–2140. Lobo AO, Siqueira IA, das Neves MF, Marciano FR, Corat EJ, Corat MA. In vitro and in vivo studies of a novel nanohydroxyapatite/superhydrophilic vertically aligned carbon nanotube nanocomposites. J Mater Sci Mater Med. 2013;24(7):1723–1732. Hirata E, Ménard-Moyon C, Venturelli E, et al. Carbon nanotubes functionalized with fibroblast growth factor accelerate proliferation of bone marrow-derived stromal cells and bone formation. Nanotechnology. 2013;24(43):435101. Im O, Li J, Wang M, Zhang LG, Keidar M. Biomimetic three-dimensional nanocrystalline hydroxyapatite and magnetically synthesized single-walled carbon nanotube chitosan nanocomposite for bone regeneration. Int J Nanomedicine. 2012;7:2087–2099. Ravichandran R, Gandhi S, Sundaramurthi D, Sethuraman S, Krishnan UM. Hierarchical mesoporous silica nanofibers as multifunctional scaffolds for bone tissue regeneration. J Biomater Sci Polym Ed. 2013;24(17):1988–2005. Marchal JA, Picón M, Perán M, et al. Purification and long-term expansion of multipotent endothelial-like cells with potential cardiovascular regeneration. Stem Cells Dev. 2012;21(4):562–574. Hu J, Feng K, Liu X, Ma PX. Chondrogenic and osteogenic differentiations of human bone marrow-derived mesenchymal stem cells on a nanofibrous scaffold with designed pore network. Biomaterials. 2009;30(28):5061–5067. Bhardwaj N, Kundu SC. Chondrogenic differentiation of rat MSCs on porous scaffolds of silk fibroin/chitosan blends. Biomaterials. 2012;33(10):2848–2857. Alves da Silva ML, Martins A, Costa-Pinto AR, et al. Chondrogenic differentiation of human bone marrow mesenchymal stem cells in chitosan-based scaffolds using a flow-perfusion bioreactor. J Tissue Eng Regen Med. 2011;5(9):722–732. Spadaccio C, Rainer A, Trombetta M, et al. Poly-L-lactic acid/hydroxyapatite electrospun nanocomposites induce chondrogenic differentiation of human MSC. Ann Biomed Eng. 2009;37(7):1376–1389. Lock J, Liu H. Nanomaterials enhance osteogenic differentiation of human mesenchymal stem cells similar to a short peptide of BMP-7. Int J Nanomedicine. 2011;6:2769–2777. Namgung S, Baik KY, Park J, Hong S. Controlling the growth and differentiation of human mesenchymal stem cells by the arrangement of individual carbon nanotubes. ACS Nano. 2011;5(9):7383–7390. Brammer KS, Choi C, Frandsen CJ, Oh S, Johnston G, Jin S. Comparative cell behavior on carbon-coated TiO2 nanotube surfaces for osteoblasts vs osteo-progenitor cells. Acta Biomater. 2011;7(6):2697–2703. Liu D, Yi C, Zhang D, Zhang J, Yang M. Inhibition of proliferation and differentiation of mesenchymal stem cells by carboxylated carbon nanotubes. ACS Nano. 2010;4(4):2185–2195. Smith LA, Liu X, Hu J, Ma PX. The enhancement of human embryonic stem cell osteogenic differentiation with nano-fibrous scaffolding. Biomaterials. 2010;31(21):5526–5535. Metcalfe AD, Ferguson MW. Tissue engineering of replacement skin: the crossroads of biomaterials, wound healing, embryonic development, stem cells and regeneration. J R Soc Interface. 2007;4(14):413–437. Huang S, Fu X. Tissue-engineered skin: bottleneck or breakthrough. Int J Burns Trauma. 2011;1(1):1–10. Vracko R. Basal lamina scaffold-anatomy and significance for maintenance of orderly tissue structure. Am J Pathol. 1974;77(2):314–346. Chandrasekaran AR, Venugopal J, Sundarrajan S, Ramakrishna S. Fabrication of a nanofibrous scaffold with improved bioactivity for culture of human dermal fibroblasts for skin regeneration. Biomed Mater. 2011;6(1):015001. Jin G, Prabhakaran MP, Kai D, Ramakrishna S. Controlled release of multiple epidermal induction factors through core-shell nanofibers for skin regeneration. Eur J Pharm Biopharm. 2013;85(3 Pt A):689–698. Değim Z. Use of microparticulate systems to accelerate skin wound healing. J Drug Target. 2008;16(6):437–448. Li H, Song JH, Park JS, Han K. Polyethylene glycol-coated liposomes for oral delivery of recombinant human epidermal growth factor. Int J Pharm. 2003;258(1–2):11–19. Huang M, Berkland C. Controlled release of repifermin from polyelectrolyte complexes stimulates endothelial cell proliferation. J Pharm Sci. 2009;98(1):268–280. Wu J, Zheng Y, Song W, et al. In situ synthesis of silver-nanoparticles/bacterial cellulose composites for slow-released antimicrobial wound dressing. Carbohydr Polym. 2014;102:762–771. Reckhenrich AK, Hopfner U, Krötz F, et al. Bioactivation of dermal scaffolds with a non-viral copolymer-protected gene vector. Biomaterials. 2011;32(7):1996–2003. Sun L, Li D, Hemraz UD, Fenniri H, Webster TJ. Self-assembled rosette nanotubes and poly(2-hydroxyethyl methacrylate) hydrogels promote skin cell functions. J Biomed Mater Res A. Epub 2013 Nov 1. Sudheesh Kumar PT, Raj NM, Praveen G, Chennazhi KP, Nair SV, Jayakumar R. In vitro and in vivo evaluation of microporous chitosan hydrogel/nanofibrin composite bandage for skin tissue regeneration. Tissue Eng Part A. 2013;19(3–4):380–392. Jaiswal M, Gupta A, Agrawal AK, Jassal M, Dinda AK, Koul V. Bi-layer composite dressing of gelatin nanofibrous mat and poly vinyl alcohol hydrogel for drug delivery and wound healing application: in-vitro and in-vivo studies. J Biomed Nanotechnol. 2013;9(9):1495–1508. Ravichandran R, Venugopal JR, Sundarrajan S, Mukherjee S, Sridhar R, Ramakrishna S. Composite poly-L-lactic acid/poly-(α,β)-DL-aspartic acid/collagen nanofibrous scaffolds for dermal tissue regeneration. Mater Sci Eng C Mater Biol Appl. 2012;32(6):1443–1451. Levorson EJ, Raman Sreerekha P, Chennazhi KP, Kasper FK, Nair SV, Mikos AG. Fabrication and characterization of multiscale electrospun scaffolds for cartilage regeneration. Biomed Mater. 2013;8(1):14103. Ustun S, Tombuloglu A, Kilinc M, Guler MO, Tekinay AB. Growth and differentiation of prechondrogenic cells on bioactive self-assembled peptide nanofibers. Biomacromolecules. 2013;14(1):17–26. Frith JE, Cameron AR, Menzies DJ, et al. An injectable hydrogel incorporating mesenchymal precursor cells and pentosan polysulphate for intervertebral disc regeneration. Biomaterials. 2013;34(37):9430–9440. Shafiee A, Soleimani M, Chamheidari GA, et al. Electrospun nanofiber-based regeneration of cartilage enhanced by mesenchymal stem cells. J Biomed Mater Res A. 2011;99(3):467–478. Bain JR. Peripheral nerve allografting: review of the literature with relevance to composite tissue transplantation. Transplant Proc. 1998;30(6):2762–2767. Biazar E, Khorasani MT, Montazeri N, et al. Types of neural guides and using nanotechnology for peripheral nerve reconstruction. Int J Nanomedicine. 2010;5:839–852. Cirillo V, Guarino V, Alvarez-Perez MA, Marrese M, Ambrosio L. J Mater Sci Mater Med. Epub 2014 Apr 16. Koh HS, Yong T, Teo WE, et al. In vivo study of novel nanofibrous intra-luminal guidance channels to promote nerve regeneration. J Neural Eng. 2010;7(4):046003. Oh SH, Kim JR, Kwon GB, Namgung U, Song KS, Lee JH. Effect of surface pore structure of nerve guide conduit on peripheral nerve regeneration. Tissue Eng Part C Methods. 2013;19(3):233–243. Ouyang Y, Huang C, Zhu Y, Fan C, Ke Q. Fabrication of seamless electrospun collagen/PLGA conduits whose walls comprise highly longitudinal aligned nanofibers for nerve regeneration. J Biomed Nanotechnol. 2013;9(6):931–943. Antoniadou EV, Ahmad RK, Jackman RB, Seifalian AM. Next generation brain implant coatings and nerve regeneration via novel conductive nanocomposite development. Conf Proc IEEE Eng Med Biol Soc. 2011;2011:3253–3257. Fabbro A, Sucapane A, Toma FM, et al. Adhesion to carbon nanotube conductive scaffolds forces action-potential appearance in immature rat spinal neurons. PLoS One. 2013;8(8):e73621. Gelain F, Panseri S, Antonini S, et al. Transplantation of nanostructured composite scaffolds results in the regeneration of chronically injured spinal cords. ACS Nano. 2011;5(1):227–236. Xie J, MacEwan MR, Liu W, et al. Nerve guidance conduits based on double-layered scaffolds of electrospun nanofibers for repairing the peripheral nervous system. ACS Appl Mater Interfaces. 2014;6(12):9472–9480. Masaeli E, Wieringa PA, Morshed M, et al. Peptide functionalized polyhydroxyalkanoate nanofibrous scaffolds enhance Schwann cells activity. Nanomedicine. Epub 2014 May 2. Pinzón-Daza ML, Campia I, Kopecka J, Garzón R, Ghigo D, Riganti C. Nanoparticle- and liposome-carried drugs: new strategies for active targeting and drug delivery across blood–brain barrier. Curr Drug Metab. 2013;14(6):625–640. Azadi A, Hamidi M, Rouini MR. Methotrexate-loaded chitosan nanogels as ‘Trojan Horses’ for drug delivery to brain: preparation and in vitro/in vivo characterization. Int J Biol Macromol. 2013;62:523–530. Malmo J, Sandvig A, Vårum KM, Strand SP. Nanoparticle mediated P-glycoprotein silencing for improved drug delivery across the blood–brain barrier: a siRNA-chitosan approach. PLoS One. 2013;8(1):e54182. Batts KP, Ackermann DM, Edwards WD. Postinfarction rupture of the left ventricular free wall: clinicopathologic correlates in 100 consecutive autopsy cases. Hum Pathol. 1990;21(5):530–535. Hayashi T, Miyataka M, Kimura A, et al. Recent decline in hospital mortality among patients with acute myocardial infarction. Circ J. 2005;69(4):420–426. Chang MY, Yang YJ, Chang CH, et al. Functionalized nanoparticles provide early cardioprotection after acute myocardial infarction. J Control Release. 2013;170(2):287–294. Ravichandran R, Seitz V, Reddy Venugopal J, et al. Mimicking native extracellular matrix with phytic acid-crosslinked protein nanofibers for cardiac tissue engineering. Macromol Biosci. 2013;13(3):366–375. Ravichandran R, Venugopal JR, Sundarrajan S, Mukherjee S, Ramakrishna S. Poly(Glycerol sebacate)/gelatin core/shell fibrous structure for regeneration of myocardial infarction. Tissue Eng Part A. 2011;17(9–10):1363–1373. Ravichandran R, Venugopal JR, Sundarrajan S, Mukherjee S, Sridhar R, Ramakrishna S. Minimally invasive injectable short nanofibers of poly(glycerol sebacate) for cardiac tissue engineering. Nanotechnology. 2012;23(38):385102. Deyhle H, Bunk O, Müller B. Nanostructure of healthy and caries-affected human teeth. Nanomedicine. 2011;7(6):694–701. Tomsia AP, Lee JS, Wegst UG, Saiz E. Nanotechnology for dental implants. Int J Oral Maxillofac Implants. 2013;28(6):e535–e546. Kasaj A, Willershausen B, Reichert C, Röhrig B, Smeets R, Schmidt M. Ability of nanocrystalline hydroxyapatite paste to promote human periodontal ligament cell proliferation. J Oral Sci. 2008;50(3):279–285. Pilloni A, Pompa G, Saccucci M, et al. Analysis of human alveolar osteoblast behavior on a nano-hydroxyapatite substrate: an in vitro study. BMC Oral Health. 2014;14(1):22. Li F, Peng J, Hu R, et al. Effect of nano-hydroxyapatite suspension on cell proliferation and cycle in human periodontal ligament cells. J Nanosci Nanotechnol. 2013;13(7):4560–4564. Besinis A, van Noort R, Martin N. Remineralization potential of fully demineralized dentin infiltrated with silica and hydroxyapatite nanoparticles. Dent Mater. 2014;30(3):249–262. Yang C, Lee JS, Jung UW, Seo YK, Park JK, Choi SH. Periodontal regeneration with nano-hyroxyapatite-coated silk scaffolds in dogs. J Periodontal Implant Sci. 2013;43(6):315–322. Ghazal M, Hedderich J, Kern M. Wear of feldspathic ceramic, nano-filled composite resin and acrylic resin artificial teeth when opposed to different antagonists. Eur J Oral Sci. 2008;116(6):585–592. Polini A, Bai H, Tomsia AP. Dental applications of nanostructured bioactive glass and its composites. Wiley Interdiscip Rev Nanomed Nanobiotechnol. 2013;5(4):399–410. Wang S, Gao X, Gong W, Zhang Z, Chen X, Dong Y. Odontogenic differentiation and dentin formation of dental pulp cells under nanobioactive glass induction. Acta Biomater. 2014;10(6):2792–2803. Mitsiadis TA, Woloszyk A, Jiménez-Rojo L. Nanodentistry: combining nanostructured materials and stem cells for dental tissue regeneration. Nanomedicine (Lond). 2012;7(11):1743–1753. Qu T, Liu X. Nano-Structured Gelatin/Bioactive Glass Hybrid Scaffolds for the Enhancement of Odontogenic Differentiation of Human Dental Pulp Stem Cells. J Mater Chem B Mater Biol Med. 2013;1(37): 4764–4772. Min JH, Kwon HK, Kim BI. The addition of nano-sized hydroxyapatite to a sports drink to inhibit dental erosion: in vitro study using bovine enamel. J Dent. 2011;39(9):629–635. Kim YS, Kwon HK, Kim BI. Effect of nano-carbonate apatite to prevent re-stain after dental bleaching in vitro. J Dent. 2011;39(9):636–642. Chatzistavrou X, Fenno JC, Faulk D, et al. Fabrication and characterization of bioactive and antibacterial composites for dental applications. Acta Biomater. 2014;10(8):3723–3732. Hernández-Sierra JF, Ruiz F, Pena DC, et al. The antimicrobial sensitivity of Streptococcus mutans to nanoparticles of silver, zinc oxide, and gold. Nanomedicine. 2008;4(3):237–240. Giri S, Braumann UD, Giri P, et al. Nanostructured self-assembling peptides as a defined extracellular matrix for long-term functional maintenance of primary hepatocytes in a bioartificial liver modular device. Int J Nanomedicine. 2013;8:1525–1539. Das S, Roy P, Auddy RG, Mukherjee A. Silymarin nanoparticle prevents paracetamol-induced hepatotoxicity. Int J Nanomedicine. 2011;6:1291–1301. Banas A, Teratani T, Yamamoto Y, et al. Rapid hepatic fate specification of adipose-derived stem cells and their therapeutic potential for liver failure. J Gastroenterol Hepatol. 2009;24(1):70–77. Kazemnejad S, Allameh A, Soleimani M, et al. Biochemical and molecular characterization of hepatocyte-like cells derived from human bone marrow mesenchymal stem cells on a novel three-dimensional biocompatible nanofibrous scaffold. J Gastroenterol Hepatol. 2009;24(2):278–287. Tai BC, Du C, Gao S, Wan AC, Ying JY. The use of a polyelectrolyte fibrous scaffold to deliver differentiated hMSCs to the liver. Biomaterials. 2010;31(1):48–57. Zarbin MA, Arlow T, Ritch R. Regenerative nanomedicine for vision restoration. Mayo Clin Proc. 2013;88(12):1480–1490. Teo BK, Goh KJ, Ng ZJ, Koo S, Yim EK. Functional reconstruction of corneal endothelium using nanotopography for tissue-engineering applications. Acta Biomater. 2012;8(8):2941–2952. Steketee MB, Moysidis SN, Jin XL, et al. Nanoparticle-mediated signaling endosome localization regulates growth cone motility and neurite growth. Proc Natl Acad Sci U S A. 2011;108(47):19042–19047. Uzunalli G, Soran Z, Erkal TS, et al. Bioactive self-assembled peptide nanofibers for corneal stroma regeneration. Acta Biomater. 2014;10(3):1156–1166. Wong LL, Hirst SM, Pye QN, Reilly CM, Seal S, McGinnis JF. Correction: Catalytic Nanoceria Are Preferentially Retained in the Rat Retina and Are Not Cytotoxic after Intravitreal Injection. PLoS One. 2013;8(3):e58431. Moghimi SM, Hunter AC, Andresen TL. Factors controlling nanoparticle pharmacokinetics: an integrated analysis and perspective. Annu Rev Pharmacol Toxicol. 2012;52:481–503. Li M, Al-Jamal KT, Kostarelos K, Reineke J. Physiologically based pharmacokinetic modeling of nanoparticles. ACS Nano. 2010;4(11): 6303–6317. Available at: http://dx.doi.org/10.1021/nn1018818. Accessed June 11, 2014. Owens DE, Peppas NA. Opsonization, biodistribution, and pharmacokinetics of polymeric nanoparticles. Int J Pharm. 2006;307(1): 93–102. Ruiz A, Hernández Y, Cabal C, et al. Biodistribution and pharmacokinetics of uniform magnetite nanoparticles chemically modified with polyethylene glycol. Nanoscale. 2013;5(23):11400–11408. Hirst SM, Karakoti A, Singh S, et al. Bio-distribution and in vivo antioxidant effects of cerium oxide nanoparticles in mice. Environ Toxicol. 2013;28(2):107–118. Patel T, Telesca D, Low-Kam C, et al. Relating Nanoparticle Properties to Biological Outcomes in Exposure Escalation Experiments. Environmetrics. 2014;25(1):57–68. Warheit DB, Borm PJA, Hennes C, Lademann J. Testing strategies to establish the safety of nanomaterials: conclusions of an ECETOC workshop. Inhal Toxicol. 2007;19(8):631–643. Martirosyan A, Schneider YJ. Engineered nanomaterials in food: implications for food safety and consumer health. Int J Environ Res Public Health. 2014;11(6):5720–5750. Cassidy JW, Roberts JN, Smith CA, et al. Osteogenic lineage restriction by osteoprogenitors cultured on nanometric grooved surfaces: the role of focal adhesion maturation. Acta Biomater. 2014;10(2):651–660. Guasti L, Vagaska B, Bulstrode NW, Seifalian AM, Ferretti P. Chondrogenic differentiation of adipose tissue-derived stem cells within nanocaged POSS-PCU scaffolds: a new tool for nanomedicine. Nanomedicine. 2014;10(2):279–289. Oseni AO, Butler PE, Seifalian AM. The application of POSS nanostructures in cartilage tissue engineering: the chondrocyte response to nanoscale geometry. J Tissue Eng Regen Med. Epub 2013 Apr 10. Ravichandran R, Sridhar R, Venugopal JR, Sundarrajan S, Mukherjee S, Ramakrishna S. Gold nanoparticle loaded hybrid nanofibers for cardiogenic differentiation of stem cells for infarcted myocardium regeneration. Macromol Biosci. 2014;14(4):515–525. Jiang X, Malkovskiy AV, Tian W, et al. Promotion of airway anastomotic microvascular regeneration and alleviation of airway ischemia by deferoxamine nanoparticles. Biomaterials. 2014;35(2):803–813. Ohtani S, Iwamaru A, Deng W, et al. Tumor suppressor 101F6 and ascorbate synergistically and selectively inhibit non-small cell lung cancer growth by caspase-independent apoptosis and autophagy. Cancer Res. 2007;67(13):6293–6303.